World Vision is the world’s largest international children’s charity, bringing real hope every day to millions of children in the world’s hardest places as a sign of God’s unconditional love. Its vision is of a world in which every child has the chance to live life to the full; where they are loved, protected and cared for, and enjoy good health and an education. Where they can live free from fear. To make this vision a reality, World Vision works alongside communities in close to 100 countries to bring about long-term change; they give children a voice in the places where decisions are made and they respond quickly to the emergencies that affect more than 250 million people around the world each year. As they do this, they focus on three key areas: child protection, child health and emergency response. Child Sponsorship helps World Vision to protect children so that they don't have to be afraid. It does this in a number of ways such as providing access to what communities need most - nutrition, clean water and healthcare. Also by helping families find other ways to earn an income so children are less likely to be 'sold off' into early marriage and miss out on an education. World Vision aims to mobilise the communities to stand up for children by forming children's groups so they may stand up for themselves and are not alone to face their adversaries. Supporting children to be registered is vitally important in order to enable access to health and education services they need. Through these sponsorship programmes World Vision is also able to monitor the well-being of children as the community becomes more child focussed and learns how to protect them from danger and abuse. Tan (not his real name), was disowned, along with his siblings by his mother because they could not live with their stepdad who was abusive and violent. They had to live in makeshift shelters. Life was very hard for all the children with Tan’s oldest sister working around the clock to feed her brothers and sisters. 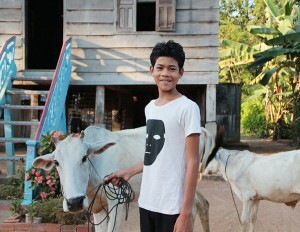 Life changed for Tan and his siblings when they became sponsored children. He remembers the time they received a bag of rice, just at the time when their rice jar was empty – part of the wider work the community owns through the rice bank and savings groups. He says he will never forget the joy he felt that someone other than his sister cared for him. They framed the photo of their sponsor and thought of her as a member of their family. World Vision staff met Tan’s mother and the local authority to advocate for the children’s rights to a small piece of their mother’s land. Finally their dream became a reality. They worked hard to pay back every penny of their housing loan. The children learned about good hygiene so they could protect themselves from infectious diseases. They also grow vegetables and plants and rear cattle, giving them both a healthy diet and a little extra money to buy household essentials, clothes and schoolbooks. How could your Company get involved? World Vision relies on giving. In response to what they have heard, could the young people organise a fund raising event for Word Vision? Could the Company take on the long term responsibility of sponsoring a child, maybe in connection with other church groups? Whatever your children & young people love doing, they can do it for World Vision. Whether it’s baking cupcakes, playing music, holding themed events or sponsored sports, their passion will help change children’s lives. If you register your event with World Vision they can send you a free Fundraisers’ Toolkit on DVD that gives you all you need to get started. You can also request a toolkit by calling 01908 24 44 17. Share the information about World Vision with your young people. They may already be aware of the charity and its work, but sharing a case study helps to bring home the differing situations that many of the World’s children face. Become a regular prayer partner for World Vision, children and young people in your Company could pray for the work of World Vision and particular situations they are working in around the world.